I was contacted by KSRF to design their annual fundraiser calendar. The 32 page calendar features nominated keeshond rescue dogs submitted by KSRF members. Thirteen dogs are chosen by vote, one cover kees and one for each of the twelve months. The calendar theme is chosen by a small calendar committee and they are also in charge of collecting all content for the calendars. The calendar also features a nominated 'Rescuer of the Year' and 'Veterinary Professional of the Year', themed content pages, and a closing spread showcasing the kees who crossed the rainbow bridge in the previous year. I'm involved with developing the theme into thirty-two pages of designed content, organizing and touching up all submitted photos, gathering supplemental design elements, and with organizing a copy editing session at the end of the process. 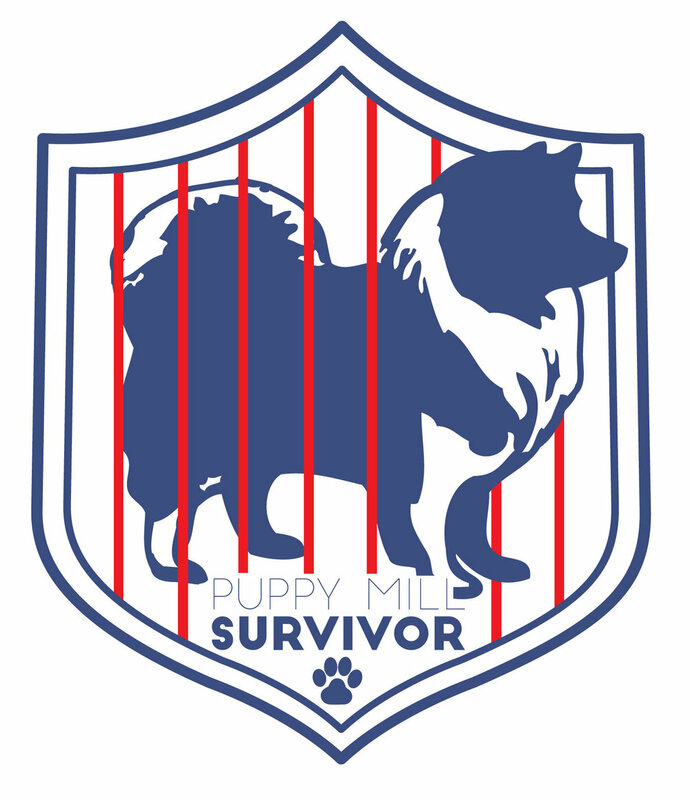 To do something special for those featured Keeshond's who had been rescued by KSRF from often horrific Puppy Mill situations, I created a 'Puppy Mill Survivor' badge. The survivor badge shows a stylized Keeshond breaking free of a cage inside a shield of safety. 2015 • help a kees shine! The theme for 2015 was sunshine! For the 'Help a Kees Shine' theme I used bright, sunshine colors of yellow and orange, toned down a bit with grays and offset with a cyan blue. This was my first year of working on the calendar and my first effort at putting together a calendar ever. For 2016 KSRF was celebrating their 20th year of providing financial assistance to Kees in foster care. To celebrate showcased selected photos from 20 years of calendar submissions on the cover, used bright party banners and color confetti throughout and the content revolved around celebrating KSRF's accomplishments. The special content reviewed twenty years of milestones for the 501 (c)3 foundation, a full list of fostered Kees that KSRF was able to assist, and a tribute to a long-time supporter of KSRF who had passed away. To celebrate with your own Kees, we also featured recipes for doggie 'paw-ty food'. This was one of my favorite calendars so far. 2017 • Kees Just Wanna Have Fun! The 2017 calendar was all about active, happy Kees. Featuring articles and information about agility classes and stylized Dutch tulips, repeated throughout, to celebrate the Keeshond's active heritage of being traditional Dutch barge guard dogs. The year of 2018 is the 'Year of the Dog' on the Chinese calendar and KSRF decided to celebrate. Ranking as the eleventh animal in Chinese zodiac, Dog is the symbol of loyalty and honesty. I used a repeating set of Chinese lanterns and stylized frames for the featured Kees' photos and a bright, warm color palette. 2019 • Kees On The Go! Keeping on the go with Keeshonds! Traveling in style with your Kees. Design of donation leaves and explanation/advertisement posters for Beyond Labels & Limitations November fundraiser. Beyond Labels and Limitations is a 501(c)3 tax exempt non-profit organization, registered with the Pennsylvania Bureau of Charitable Organizations dedicated to raising funds towards researching Limb-Girdle 2-A muscular dystrophy (Calpain 3, LGMD2A) which is among the most common of the muscular dystrophies. For this project, I wanted the leaves to create a tree going into fall once the leaves were purchased and posted up on the walls of the spaces they were being sold. To do this I used variegated greens for the one dollar donations and reds and oranges for the higher five dollar donations. The poster giving information about the charity and the 'Giving Thanks' donation leaves combined the two types of leaves. With the bright white background and pop of cyan in Beyond Labels & Limitations logo, the leaves were quite eye catching once up. "The Angels' Share" is whiskey slang for the rough percentage of malt whiskey that evaporates from the cask as the whiskey ages – given to the angels if you will. McCarthy's Red Stag Pub and Whiskey Bar believes in giving back to their community as they age and mature, and so give eight months of Wednesday nights towards raising funds for local charity and nonprofit organizations. On Angels' Share Nights – with the support of the featured organization – they donate 5% of all food and beverage sales and hold raffles for tickets to win a table at the annual end-of-the-year fundraiser wrap-up dinner in November. 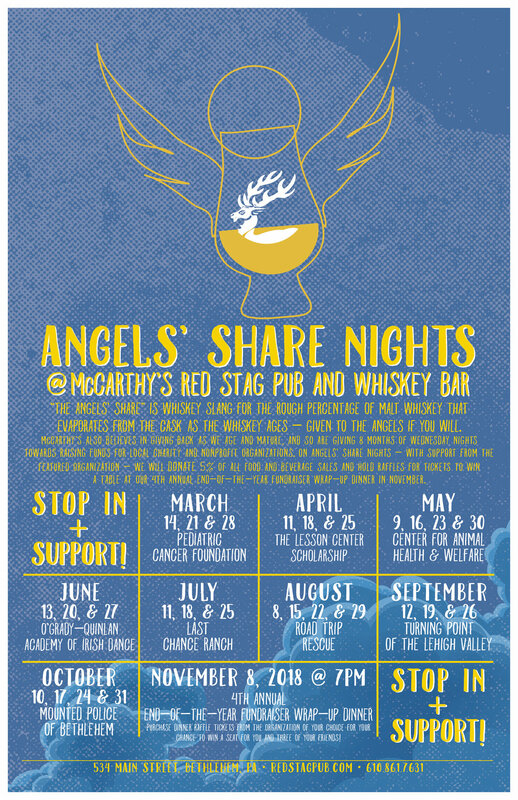 The 'Angels' Share Nights' program has been quite a success for the pub and whiskey bar, and I hope they continue with it for many years to come. For the 'Angels' Share Nights' I created an angelic Glencairn Whisky Glass, soaring off into a night sky. The Glencairn Glass of course has McCarthy's circle stag mark 'etched' into it. The poster needed to explain succinctly what the Wednesday nights were all about, show the featured charities and organizations, and the dates that the organizations would receive the 5% of sales from food and beverages. 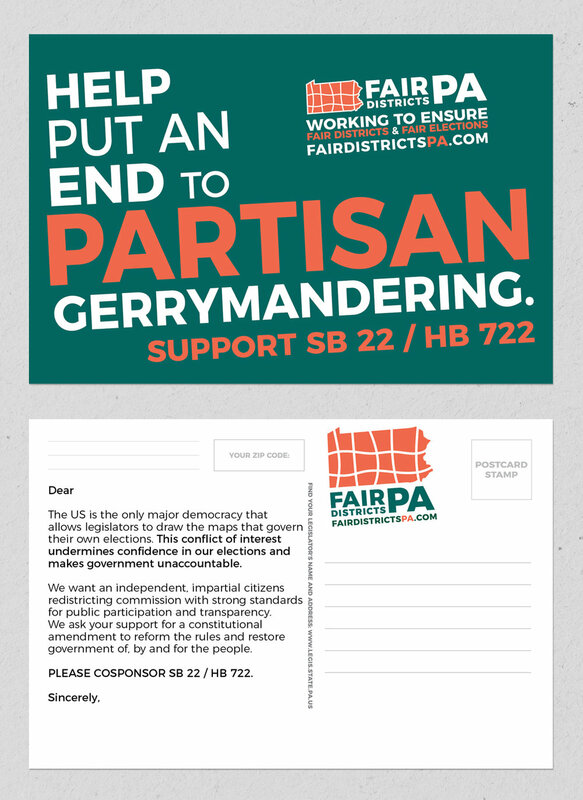 Fair Districts PA is a nonpartisan, citizen-led group working to change the state constitution so we can stop gerrymandering in Pennsylvania for good. Redistricting will happen again after the 2020 Census, and if it follows the same process as last time, the 2021 map is likely to be gerrymandered, too—regardless of which party is in power. Two bipartisan bills have been introduced to create an independent citizens’ commission to be in charge of an open process to redraw PA maps without the influence of politicians: PA Senate Bill 22 and PA House Bill 722. Thanks to the efforts of Fair Districts PA's volunteers and swift actions the bills are supported by a growing list of legislators from across the state—in fact, HB 722 is the most-sponsored bill this entire session. For Fair Districts PA I assisted with the creation of a t-shirt for supporters to wear to Harrisburg rallies and other events throughout Pennsylvania and put together 4x6 "Petition your Representative" postcards to be filled out by constituents and mailed to convince legislators to support the FDPA bills. For the t-shirt, I added their website address to the bottom of the Fair Districts PA logo, distressed it and put it on a tilt to be more dynamic when worn. The dark green and orange of the logo looks great against a heathered grey t-shirt background. The postcards needed to be visible and easily read. I didn't want them getting lost in the mail piles of legislators desks. For the reverse of the cards, there is a pre-written message, the FDPA logo with the website again, and a special Zip Code Box I created. The Zip Code Box was designed for the sender to clearly display their zip code, so that the legislators could easily see that it was indeed their constituents sending the cards.